Zacchaeus said to the Lord (Jesus), "I want to do good. I will give half of my money to the poor. If I have cheated any person, I will pay that person back four times more!" Jesus said, "Today is the day for this family to be saved from sin. Yes, even this tax collector is one of God's chosen people!" Zacchaeus is a living example of repentance in this passage. 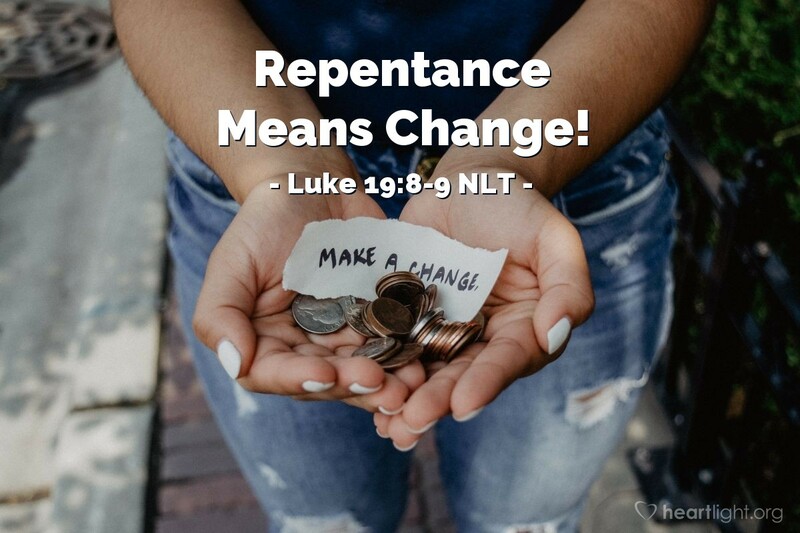 Repentance is a change of heart that leads to a change of life. Zacchaeus was so touched by the Lord's loving presence, his heart was changed and he made a commitment to change his lifestyle. That kind of change is the mark of salvation and the guarantee of a new person! Father, thank you for the joy your salvation brings. I praise you for the joy and hope my salvation has brought to me. Please empower me with your Spirit to produce the fruit of repentance, a life that blesses others and brings glory to you. In the name of Jesus Christ, my Lord, I pray. Amen.